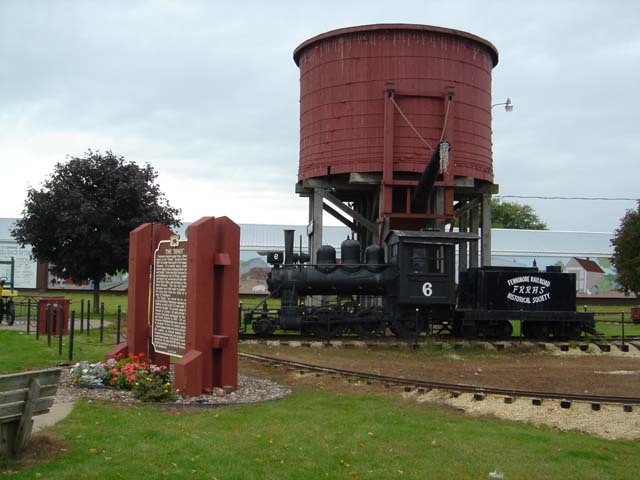 Located Highway 61 and 6th St. Fennimore, WI Coordinates Lat N 42:59':196" Lon W 90:39':346"
c known as the "Dinky, operated from 1878 to 1926, far longer than most 3-foot gauge lines in Wisconsin. At a nearby depot, standard and narrow gauge trains exchanged their passengers and freight. Trains ran daily between Fennimore and Woodman by way of Werley. Anderson Mills and Conley Cut, meandering 16 miles through the Green River Valley and serving as a key link to other railroads. The line was famous for a horseshoe curve that made it possible to climb the steep slope from the valley to the ridge west of Fennimore. 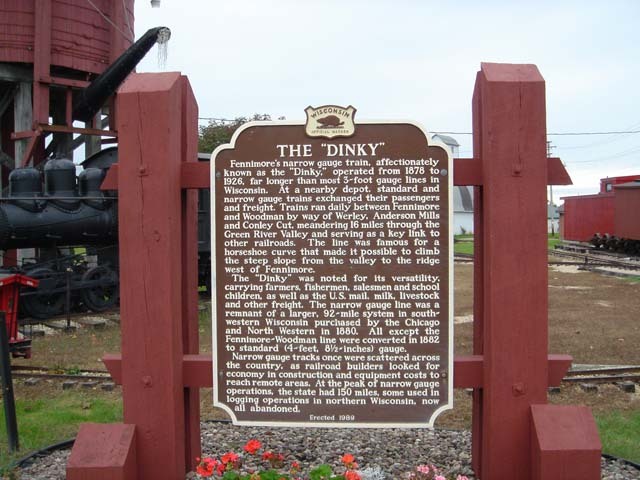 The "Dinky" was noted for its versatility. carrying farmers, fishermen, salesmen and school children, as well as the U.S. mail, milk, livestock and other freight. The narrow gauge line was a remnant of a larger, 92-mile system in southwestern Wisconsin purchased by the Chicago and North Western in 1880. All except the Fennimore-Woodman line were converted in 1882 to standard (4-feet, 81/2-inches) gauge. Narrow gauge tracks once were scattered across the country, as railroad builders looked for economy in construction and equipment costs to reach remote areas. At the peak of narrow gauge operations, the state had 150 miles, some used in logging operations in northern Wisconsin, now all abandoned.